Kavanaugh’s years at Georgetown Prep, in a Maryland suburb of Washington, are under intense scrutiny because of allegations by Christine Blasey Ford that he sexually assaulted her during high school. Kavanaugh has denied the allegation. He and are scheduled to testify Thursday before the Senate Judiciary Committee. Kavanaugh’s peers have given different accounts of what he was like. But his yearbook provides a contemporaneous glimpse of the elite Catholic school’s hard-drinking atmosphere — Kavanaugh’s personal page boasts, “100 kegs or bust” — and a culture that some describe as disrespectful to women. When Dolphin signed the Sept. 14 letter, she wasn’t aware of the “Renate” yearbook references on the pages of Kavanaugh and his football teammates. Alexandra Walsh, a lawyer for Kavanaugh, said in a statement: “Judge Kavanaugh was friends with Renate Dolphin in high school. He admired her very much then, and he admires her to this day. Dolphin said she had never kissed Kavanaugh. “I think Brett must have me confused with someone else, because I never kissed him,” she said through her lawyer. In an interview on Fox News on Monday, Kavanaugh defended his high school behavior in general terms. “People might have had too many beers on occasion and people generally in high school — I think all of us have probably done things we look back on in high school and regret or cringe a bit,” he said. A White House spokesman, Raj Shah, declined to comment beyond the statement from Kavanaugh’s lawyer. Four of the men who were pictured with Kavanaugh in a photo captioned “Renate Alumni” said it was simply a reference to their dating or going to dances with Dolphin. An elite Catholic boys’ high school founded in 1789, Georgetown Prep is known for its motto, “Forming men for others,” a reference to its many alumni who have gone into public service. Justice Neil M. Gorsuch of the Supreme Court is a graduate, as is Jerome H. Powell, chairman of the Federal Reserve. 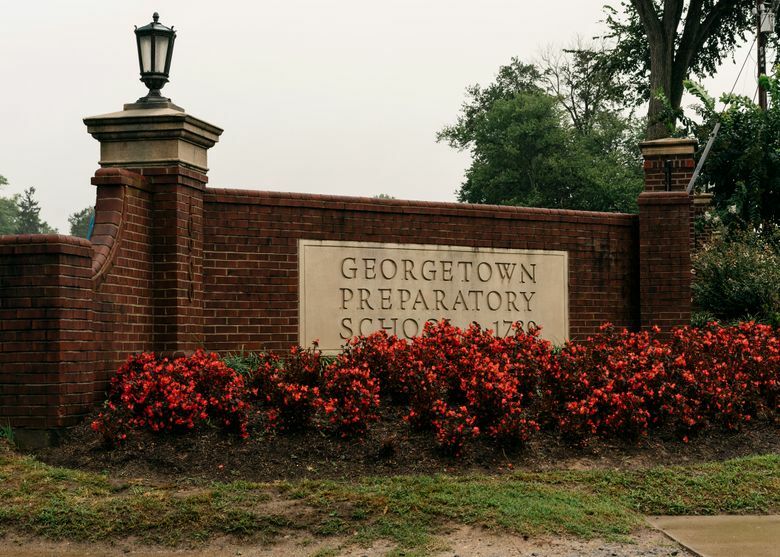 Kavanaugh, a member of the football team and the captain of the basketball team, played a prominent role in Georgetown Prep’s firmament in the early 1980s. The school’s culture was one of heavy drinking and at times insensitivity. Some of Kavanaugh’s high school peers said there was a widespread culture at the time of objectifying women. Bill Barbot, who was a freshman at Georgetown Prep when Kavanaugh was a senior, said Kavanaugh and his clique were part of the school’s “fratty” culture. “There was a lot of talk and presumably a lot of action about sexual conquest with girls,” Barbot said. Dolphin was a subject of that braggadocio, according to Hagan and another classmate, who requested anonymity because he fears retribution. They said Kavanaugh and his friends were seeking to memorialize their supposed conquests with the “Renate” yearbook references. “She should be offended,” Hagan said of Dolphin. “I was completely astounded when I saw she signed that letter” on Kavanaugh’s behalf. Some women who knew Kavanaugh at the time defended his conduct. The Georgetown Prep yearbook’s personal pages were designed and written by the individual students, according to Madaleno and other alumni. A faculty adviser reviewed the pages. The group photo, with Kavanaugh and eight fellow football players in pads and uniform, grinning, was captioned “Renate Alumni.” Mark Judge, the commentator and author who has written about his alcohol-fueled years at Georgetown Prep, stands next to Kavanaugh in the photo. Barbara Van Gelder, a lawyer for Judge, declined to comment. Walsh, a bank executive in Virginia, was one of scores of Georgetown Prep alumni who signed a letter to Senate Judiciary Committee leaders vouching for Kavanaugh’s “sharp intellectual ability, affable nature, and a practical and fair approach devoid of partisan purpose.” He did not respond to requests for comment. Dolphin was aware that members of Kavanaugh’s clique were reciting that poem, according to a person familiar with her thinking. She told the football players that she found it offensive, believing it made her seem like a cheap date, and she asked them to stop. A high school friend of Dolphin’s, who also signed the letter to the Senate Judiciary Committee, said that while she stood by the letter’s contents, as a friend of Dolphin’s she was “sickened” by the yearbook’s “Renate” references. She and a second friend of Dolphin’s denied that there was any sexual contact between Dolphin and Kavanaugh or anyone else in his circle.